As you might know, Sig and I went on holiday to Krakow in September. We knew we wanted to visit Auschwitz during our holiday. The Auschwitz concentration camp was a network of concentration and extermination camps built by Nazi Germany during the Second World War. About one week before our holiday, Netflix suggested a documentary to me. It was the documentary Auschwitz: The Nazis and the Final Solution. Since we had already plans to visit Auschwitz, we decided to watch the documentary in advance. And I'm glad we did. We saw the entire documentary via Netflix. It focuses on Auschwitz and everything that happened there. They show interviews with people who were there: both people who were held in Auschwitz and former members of the SS. The documentary also shows rare films from archives, computer-generated reconstructions and re-enactments of events. I thought it was very good documentary. The total duration is 4 hours and 45 minutes. There are 5 episodes. it was a very impressive documentary. 1,1 million people died in Auschwitz. They show how Auschwitz looked, the evolution of Auschwitz and the mentality of the perpetrators. It's based on documents and plans that were only discovered since the opening of archives in Eastern Europe. The documentary made a big impression on me. I really advice everyone to watch it. I thought it was shocking to see the interviews with former members of the SS. 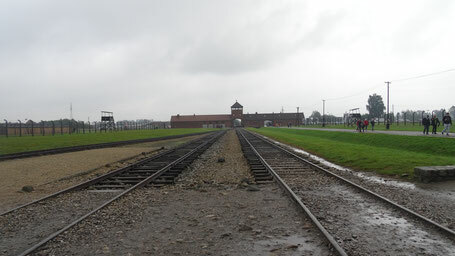 The documentary also gives an unique view on how Auschwitz looked. Especially if you're not able to really visit, this documentary will give you s much information. When we arrived at Auschwitz, the driver from the our car gave us instructions and handed out umbrella's . It was a rainy and cloudy day. And me being me, I just stood there in a t-shirt (without a coat or anything). I was glad to be handed an umbrella. We also bought a poncho. It took some time to enter Auschwitz. everything was checked: All the things you wanted to take with you etc. Because of that, our group was a bit late and the guide had already started. We were with a large group (>30) and we would all get a device with headphones to listen to the guide. We rushed to the group. We started at Auschwitz I. 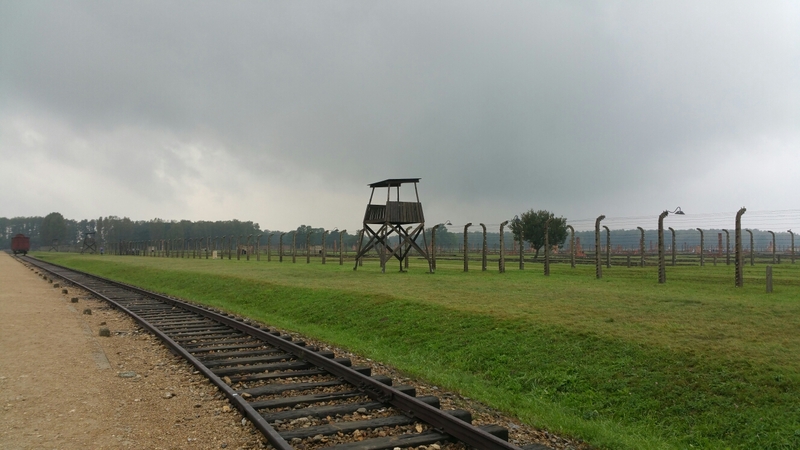 Later that day, we would also see Auschwitz Birkenau. There were A LOT of groups at Auschwitz. It felt a bit strange. All these large groups of about 30 people, with a headphones on following the guide. For me the headphones created some distance. We would enter some building and get an explanation from the guide. But you would hear everything via the earphones. There were constantly groups before and after us. Everything happened in a quick pace. I was really really glad that Sig and I had already watched the documentary. I already recognized some buildings and knew some background stories, thanks to the documentary. That made it easier to follow the quick pace. Not all information was new to us. The visit to Auschwitz and Birkenau was very impressive. There was so much information, big parts that are still intact. our guide told us a lot about World War II. She told what Auschwitz looked like and how people were treated. It was a pity that the pace was very quick. Sometimes there was just not enough time to feel all the emotion in a place with so much history. At certain moments I wished I could just stand still for a moment and think about what happened. But in the guided tours, there was no time for that. The next group was already waiting to enter the room. Even though, it's very confronting to walk around there and realize all the things that happened. 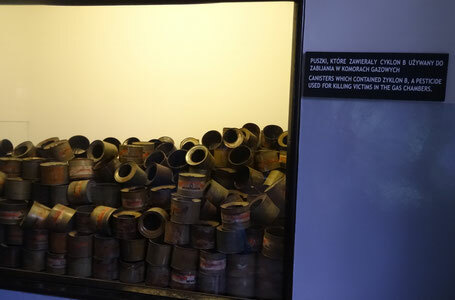 There quite some things that made a huge impression on me: Seeing the canisters which contained the pesticide for killing victims in the gas chambers. In one of the museum building there was also a display of human hair that was shaved of from the heads of the Jews. In Birkenau, we entered one of the barracks. It was terrible idea to realize how people had to live there. For everyone who is interesting in the Second World War and the concentration camp I'd recommend watching the documentary Auschwitz: The Nazis and the Final Solution on Netflix. Not only does it give you insight in how the concentration camps looked, but it also provides you with a lot of information and unique interviews. Also, if you're visiting Auschwitz, I'd definitely watch this before going. You'll need the background to take your time and let everything in that you're experiencing there. (And you can also visit Auschwitz on your own. It's not obligated to visit it with a guide). Wow, this must have been quite the educational vacation. I'm sure it was a lot of feelings like you said. I'll definitely prepare myself by watching the documentary before visiting Aushwitz! Is this documentary still on Netflix? I'll have to check it out. We were going to go to Auschwitz and Poland on our travels this year, but ultimately decided against it. I would still love to go, but I think I'd be a little weirded out by the large crowds. I'm glad for the warning to prepare a bit for the experience since it goes by so fast! So how was the feeling when you guys stepped on the area? Did it had an eery feeling or something? I would love to check out that documentary on Netflix. I hope it's available in our country. I haven't really read much about the Nazi camps and what happened back then. I only know some parts. Hm, my thoughts about Auschwitz, Hitler , KZs and the german history in general is very ...how to find the right expression ... I mean , as a German citizen myself , I sometimes feel like "just leave it for now" . All these memorial days and also on tv , repetitions of all these horrible things. My mom lost both her parents , my grandad never came back home from war. I wasn't even born ... but that is such a sticky label ALL Germans still now have to deal with. I know, it's hard to believe but I have experienced that more than just once, especially living in a foreign country. How many times have I just made sure,nobody would notice , that I am German. Sad,but true. You are so much into the movie world, you see ... 'Schindler's List' and 'La Vida e Bella' are 2 of my favourite movies , La Vida e Bella is probably the Best film I have ever seen. Still an awful horror scenario , I have seen photos with piles of shoes and personal belongings of Auschwitz victims ... just awful. Perhaps one might consider this episode in the history of mankind one of the worst in history. I know how there are people who like to dramatize the Final Solution as the worst atrocity ever but we have like 5000 years of history to look back to. I pegged 5000 because that is how old the civilizations are today. And if there's something about people, it's that we have a knack for violence and all kinds of wars. I like that you watched a documentary to have a better understanding first before going out there to visit. Good one visiting a place that serves as a reminder of all those people who died. I feel so sad reading this one because of the documentary. I desire I could able to watch about it very soon. This is such a great educational tour that you have gone through. By the way, I actually like how you customize your website very beautiful. Thanks for sharing your idea and recommending the Netflix documentary. I'm sure your experience was very educational, eye-opening, and chilling at the same time. I've seen videos on this camp before and they had shoes of all the babies and children that were there. It makes the hairs on my body stand just thinking about them... I know displays like this serve as a reminder of how far we have come but I certainly can't wait til these reminders of past and hate are replaced with reminders of love and hope for the future. This sounds something I would love to watch. I really don't know why but I'm so passionate about documentaries about WWII. I shall go search for it on Netflix. 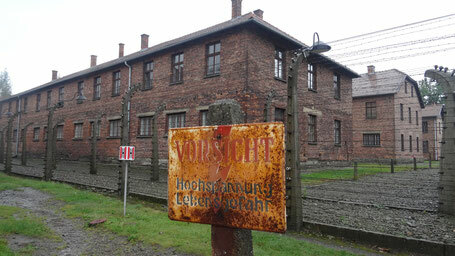 I didn't knew I could go on Auschwitz without a guide, that's actually more appealing I think. It's one serious tour to take, knowing how deep the emotions it had left to people all over the world. I've just recently been a little oriented to Auschwitz thru a movie I've watched - The Reader. It's not really more on history of Auschwitz but a scene or two shown somehow the pains of those times. It would be eery for me I guess to visit a place with rich history of humanity's suffering. I would likely go on a guided tour and would like to have more people on the group. Lol. Thanks for sharing your courageous and educational tour to Auschwitz! Lots of people would rather skip these when traveling. In Cambodia, I went to Phnom Penh's killing fields and Tuol Sleng Museum. It left me with a heavy heart. But I felt like it's something I needed to do to learn about the country in a deeper way. Not everything is about tourism, but also culture and history. I have heard so much about Auschwitz and it is a dream of mine to go there for its historical significance. I am not an expert of the Nazi's regime, but I know enough to know how much crimes they have committed against humanity. I haven't seen the documentary that you mentioned and I think I should look it up and get more educated about this whole thing. I am really curious. Then hopefully I could visit Auschwitz myself. I know how you mean about guided tours. It's not ideal for people like me who want to linger a little bit more and really see the exhibits. How very timely. We just received a 6 months subscription of Netflix. I hope the documentary is available in our country. After reading your post, it made me interested in watching it. I find it odd that there was both a talking guide and headphones. Is it because the language in the headphones is different or there was really just redundancy? It must have been an educational tour for you! You said those headphones created distance? Like how? Was there less interaction with other guests because of it? Thanks for sharing! This is something that I didn't know, and worth sharing with my kids. It must have been an educational and fun tour for the both of you! I will look for Auschwitz in Netflix to watch this documentary. I was wondering what the experience would be like walking thru the place and all those abuses playing at the back your head, feeling creepy, angry?